A sweet milk stout with all the malt characteristics you love but with a bold, unique twist – blueberries and maple syrup. A rich, sweet stout with classic malt characteristics with a bold, unique twist. 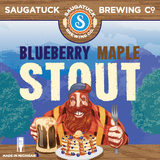 This beer tastes like you crammed a fat stack of blueberry pancakes into a pint glass and smothered it with maple syrup. Channel your inner lumberjack, because it’s in for a real treat.